Barron's brand-new Easel Series is designed for absolute beginners who want to try their hand at painting but don't quite know how to get started. 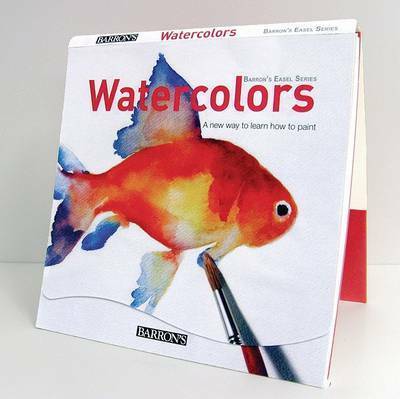 Each book takes an innovative approach to art instruction as it teaches fundamentals of a specific art medium. The books present carefully devised, step-by-step explanations of each detail to be accomplished on the painting-in-progress, making use of innovative book covers that can be set up to create a miniature easel. Each project appears as a series of two-page sections, with an illustrated explanation of how to proceed on each every-numbered page, and the painting-in-progress to be copied on the following odd-numbered page. The easel format encourages beginners to stand their book up and let the progressive illustrations for each project serve as their step-by-step tutorial. With every flip of a page, they will see the painting that they are copying in progressive stages of completion. All that remains for them to do is to take up their brushes, start working, and keep on flipping pages until they have their own handsome finished painting. Watercolors presents seven separate projects for students to complete. Subjects include still lifes, flowers, and landscapes.